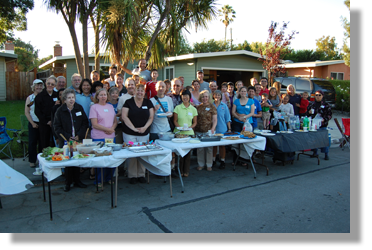 Block parties provide an opportunity to meet your neighbors, build camaraderie, and have a good time. 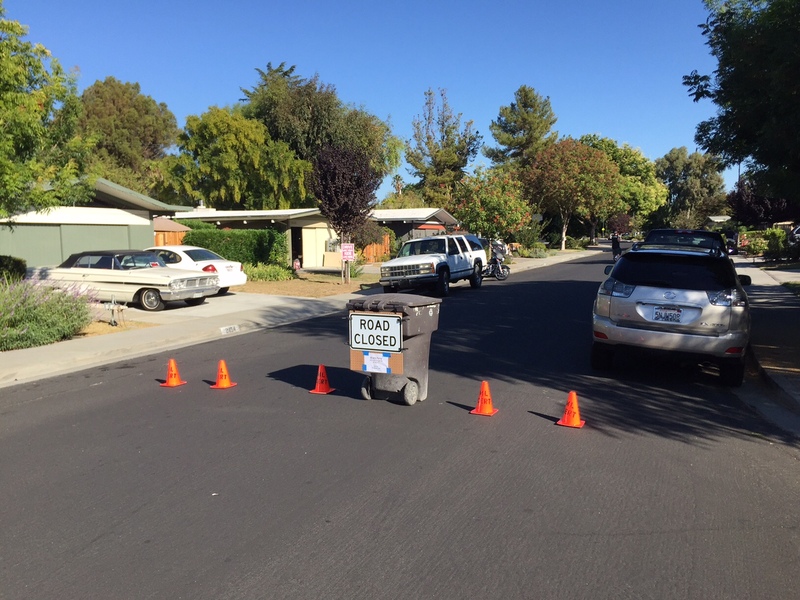 Neighborhood Watch is an important aspect of a safe and secure neighborhood. Combined, they help make Monta Loma a better place to live. Neighborhood Watch Captain Tom Purcell created maps showing the locations of the block parties held in 2016, 2017, and 2018. Links to these maps are also on the Maps page. Photos of the 2016 and 2017 2500-block of Alvin’s block party are here. Photos of the August 2018 Thaddeus/Emmons/Richard Court party are here. 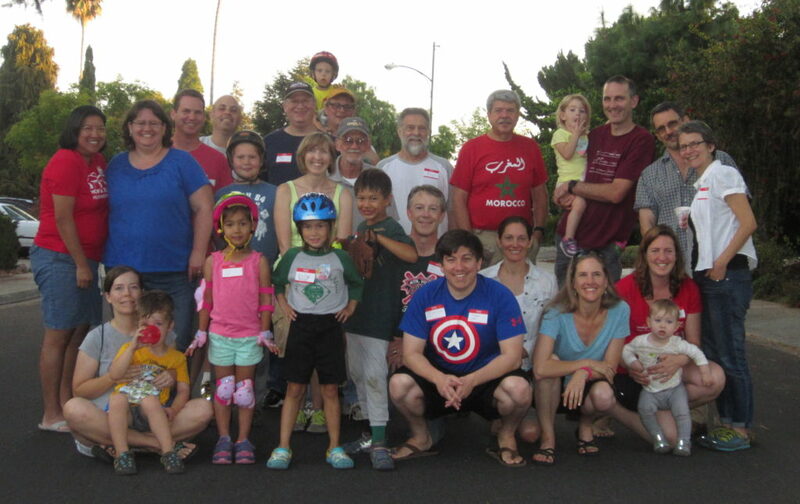 You and your neighbors on at least one block-long street organize and execute a block party. There are a variety of formats the block party can take: inside a home, in someone’s back yard, in one or more front yards and driveways, or you can block off a portion of the street and have it out in the open so it’s most inviting. If you want to block off all or part of a street, you must obtain a permit from the MV Police Department. You can pick up a block party application at the MV police station or download it. (If you would like an officer to stop by your party, request it on the application.) Return the completed form to 1000 Villa St. Mountain View 94041. There may be a follow-up call to the applicant. Allow 30 days for approval because the application must be approved by the Police Department, Fire Department, and Traffic Engineer. The application notifies city services that you will be blocking off the street, so in case of emergency, police cars and fire trucks will not come barreling through, endangering you and your neighbors. Any street barricades must be movable for emergency access. There is no fee for the city permit and the applicant will be contacted to pick up the permit once it is approved. The City does not provide barricades, but you can borrow orange safety cones and “Road Closed” signs from CERT. Contact John Thomas via CERT@montaloma.org to arrange for pickup and return. The MLNA will provide partial reimbursement based on the number of participants: $50 for parties with 10-19 people, $100 for parties with 20-39 people, and $150 for parties with 40 or more people. 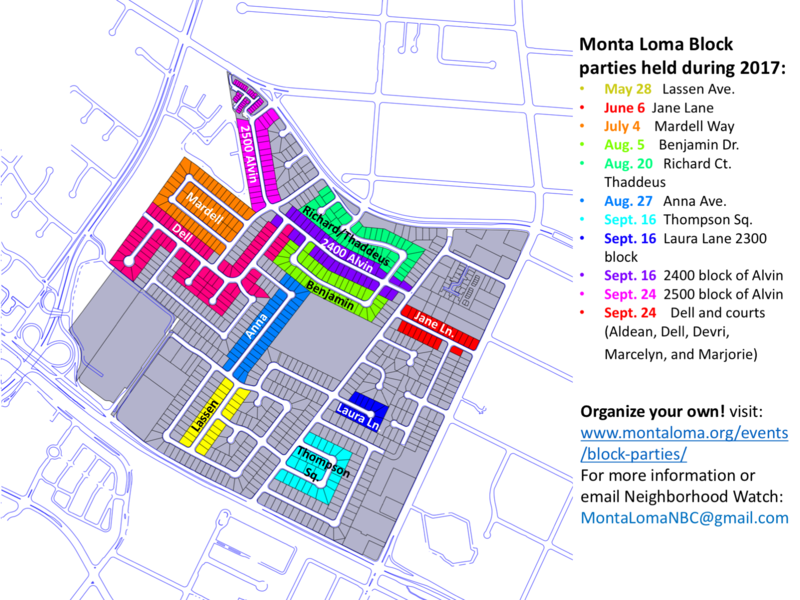 Use this attendance sheet to verify the names and number of participants, plus their addresses as residents of Monta Loma. The reimbursement will be made by check to the designated person upon tendering the sign-in sheets (originals, not copies) to the MLNA treasurer, Andre Valente. All sign-in sheets must be submitted together, even for parties of two or more streets. Only one reimbursement check will be issued. Including a self-addressed envelope will speed reimbursement. It’s wise to distribute a flyer in advance of your party, asking neighbors to bring needed items. You can display or download a Microsoft Word document containing sample invitations plus a sample list of needed items (PDF), and the attendance sheet (PDF). For the benefit of new residents, you can print a sign-up sheet for a Welcome Packet to place next to the attendance sheet. If you have any questions, contact the MLNA Board. Display or download a printable version of this information in Microsoft Word.